Father’s Day is coming up. What if, instead of a tie, you could get the dad in your life a lunch date with his favorite professional athlete? Thuzio, a new service dedicated to connecting the public with a network of professional athletes, is here to help. The best thing about Thuzio? It’s so darn simple. 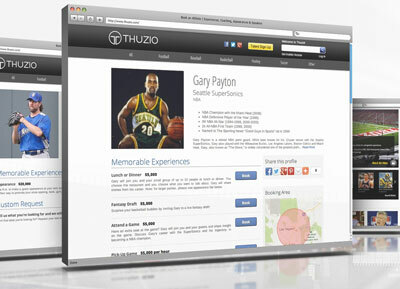 Just head to Thuzio.com, browse the catalog of athletes and choose from the listings of experiences. This could be anything from a birthday party appearance to one-on-one lunch to a private training session. Once you hit the “Book” button and choose a date and location, you’ll get a confirmation within 48 hours. Thuzio's roster of athletes is impressive. There are dozens of veterans from each of the major professional organizations—NFL, MLB, NBA, NHL and soccer—as well as top Olympic athletes. Where else could you book Sasha Cohen to give your daughter a private skating lesson or have Tiki Barber help dad out with his fantasy football draft picks? Pricing varies depending on the athlete and activity, but there are plenty of options for private lunches or lessons from well-known athletes for as little as $100. Which makes Thuzio the perfect place to find special gifts for your friends and family (or treat yourself to time with one of your sports heroes! ).